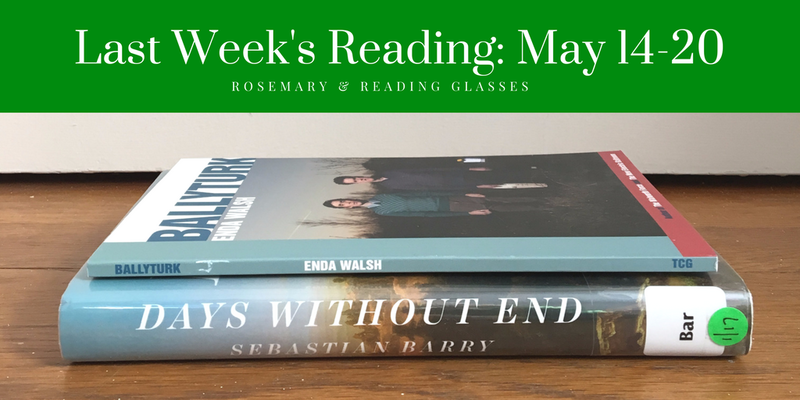 Days Without End, by Sebastian Barry: I’m not sure what I was expecting when I heard that noted Irish author Sebastian Barry’s new book was set in the American West, but it wasn’t Days Without End. The narrator, a member of Mr. Barry’s McNulty family, is Thomas, who escapes the brutal famine of Sligo only to find more violence and pain as a soldier, first fighting the Sioux in the West and then other Irish boys (but in gray) in the South. Though not immune to the toll of the carnage, Thomas tends to accept it as the way of the world. So too he accepts his love for John Cole, whom he met when they were half-starved boys. Together they care for Winona, a Sioux girl kidnapped after an army raid, trying to keep their small family afloat against terrible odds. Thomas’s narration is dreamlike and yet precise, ungrammatical and yet boasting an astounding vocabulary (“Empurpled rapturous hills I guess and the long day by brushstroke enfeebling into darkness and then the fires blooming on the pitch plains.”). It’s not perfect, but Days Without End is a bold, fearsome beauty of a book. Highly recommended. Ballyturk, by Enda Walsh: I’ve had this play on my shelf for awhile, and I figured a dip out of my comfort zone would do me good. Ballyturk, which is about two men confined in a room and the worlds and rituals they construct for themselves, is one of those plays that I suspect is more dynamic in performance than in print. It’s quite odd in the beginning, though things (mostly) start to make sense near the end. One character has a long, lovely speech that made me wish the whole play had been written in that mode, rather than tending toward the absurdist—or maybe I wished I were reading a novel in that key. Anyway, I know I’m being rather vague here but I don’t want to spoil it for anyone who might see it in performance. Beckett fans, this might be of interest. In Afterland*, her first collection, Hmong-American poet Mai Der Vang summons the specters of the Secret War in Laos and the resulting exodus of Hmong refugees (including members of her family). Afterland is a beautiful and painful memorial to the trauma of war and exile. I was also particularly struck by poems about language, like “Original Bones” and “Mother of People without Script” (Paj is not pam is not pab. / Blossom is not blanket is not help. — you can listen to the poem here), and by the way Ms. Vang uses language about writing in other poems (“I have heard the flames / hunting inside your glossary”). carpenterias and fiddlenecks of spring. than bamboo, and the rains unable to assemble monsoons. Still, look out to the distance from where you lie. You will see Mt. Whitney is as beautiful as Phou Bia. The moon is sharp enough to cut your ear as the one from your village. 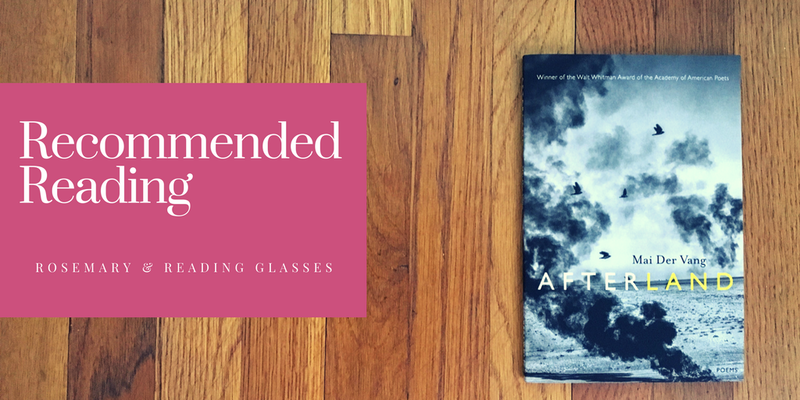 Afterland is an impressive collection, a luminous portrayal of loss and survival, and filled to the brim with blistering imagery. Highly recommended. Each Leaf Shines Separate, by Rosanna Warren: This is Rosanna Warren’s first collection, and it’s lovely. Quite a few ekphrastic poems here, and they’re excellent. I also particularly liked the poems about snow (“I had not yet / entered that white.”), and those about motherhood, near the end of the book. If you like lyric poetry, there’s much to enjoy here. The Ink Dark Moon, by Ono no Komachi and Izumi Shikibu, translated by Jane Hirshfeld with Mariko Aratani : These are beautiful, spare poems by poets who lived a thousand years ago in the Heian court of imperial Japan. 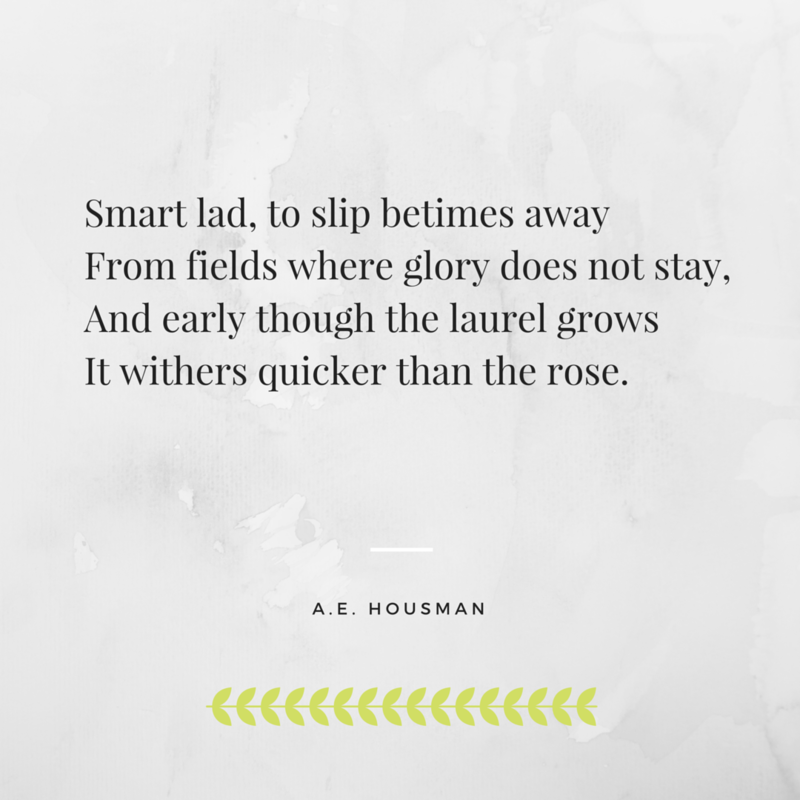 The poems, infused with the sense of life’s ephemeral nature, are both private and public; some intimate, some focused on deeply personal spirituality. Grief and love are amply represented. I appreciated the introduction and notes to the poems, and I’m so grateful for translators like Ms. Hirshfeld and Ms. Aratani! This is a compelling collection, and highly recommended. 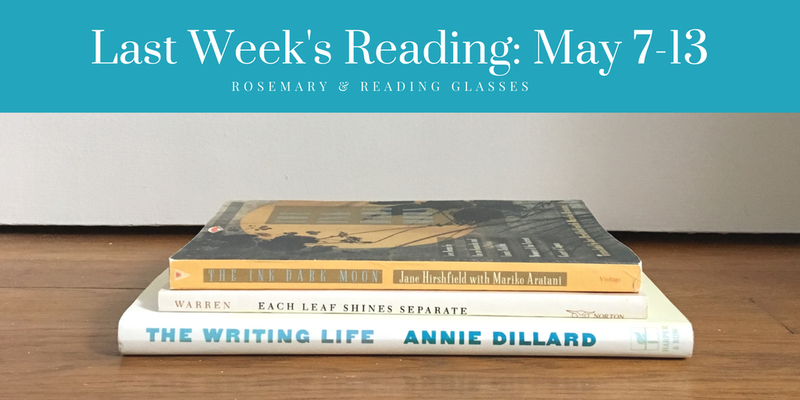 The Writing Life, by Annie Dillard: My uncle and aunt visited us last week, which was delightful, and my uncle brought three books on writing with him, which was very kind. Of course, reading Annie Dillard–the fiery prose, the crisp, surprising sentences, the assured pronouncements–made me feel that my own writing is a hopeless mess, but it gives me something to strive for. Ms. Dillard’s writing life is (alas? fortunately?) not my own writing life, but I’m so glad to have been immersed in it for a little while. Looking for the Gulf Motel, by Richard Blanco: I read most of these poems out loud, in the car with my family on the way to my grandfather’s funeral, and was surprised to find myself tearing up a bit. Mr. Blanco (the 2013 inaugural poet) grew up in the Cuban exile community in Miami, and the poems in Looking for the Gulf Motel speak movingly of his family and childhood memories. If you’re looking for a smooth-reading collection with a strong sense of place, I highly recommend it. Dept. 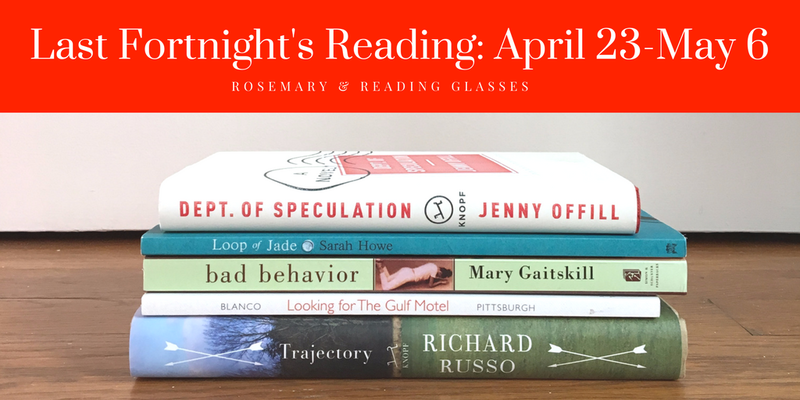 of Speculation, by Jenny Offill: This very short, almost pointillist novel anatomizes a disintegrating marriage, and it’s particularly sharp on motherhood. Recommended. Bad Behavior, by Mary Gaitskill: This 1988 collection, Ms. Gaitskill’s first, could have been written yesterday; its themes of discontent, isolation, and desire still resonate. I’m not sure there’s a single likable character in the book, which makes it simultaneously fearless and disquieting. The writing is very, very good, but I can’t say I’ll come back to this one. Loop of Jade, by Sarah Howe: One of the best collections I’ve read this year (and I’ve read some great ones). I loved Ms. Howe’s use of form, her facility with language, the sheer variety in Loop of Jade. Ms. Howe was born in Hong Kong and lives in the UK (her father is British, her mother Chinese), and Loop of Jade explores her heritage through narrative and lyric poems. Exquisite, and highly recommended. Trajectory, by Richard Russo: After last year’s disappointing Everybody’s Fool, I was wary about this collection of four stories/novellas (three can be found elsewhere; one is brand new). However, Mr. Russo is back to form here. Particularly affecting are “Horseman” (a college professor confronts a cheating student and her own past) and “Milton and Marcus,” which features thinly-veiled portraits of Paul Newman and Robert Redford. Recommended. A light week, Dear Readers, for the best of reasons: a delightful post-Easter visit from family. Hope you’re all enjoying spring (or autumn, for you Southern Hemisphere folks). Afterland, by Mai Der Vang: A haunting debut poetry collection; full review to come. 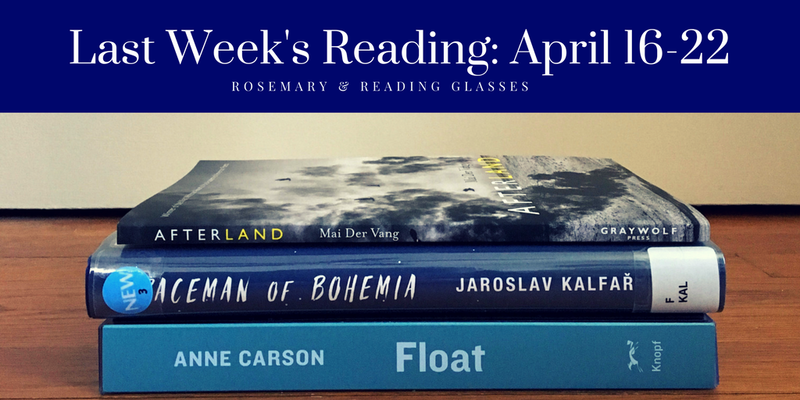 Spaceman of Bohemia, by Jaroslav Kalfar: Like Meg Howrey’s The Wanderers, Spaceman of Bohemia is literary sci-fi that explores questions of surveillance, ambition, and love, but it’s quite a bit weirder and much less invested in realism. In 2018, Czech scientist Jakub becomes his country’s first astronaut, sent into space (in a ship whose components are named after various sponsoring companies) to study a cloud of cosmic dust near Venus. The mission takes Jakub from his beloved wife Lenka, but offers him the opportunity to rise beyond the taint of his Communist informant father’s past. However, lonely days in space start to feel less like heroism and more like insanity; soon Jakub is conversing with a Nutella-loving giant space spider (Imaginary? Maybe, maybe not) and sharing, almost re-living, his childhood memories of the rural village where his grandparents tried to protect him from the consequences of his father’s sins. Spaceman of Bohemia is an odd and touching debut novel, and I recommend it. Float, by Anne Carson: I bought Float last fall as a birthday present to myself, but after paging through it, decided to wait for a quiet day to take it all in. That day was Saturday, but I think I’ll need quite a few more before I process the whole thing. Float is a collection of 22 chapbooks that can be read in any order. Poetry, essays, lectures, performances, hybrid forms—they’re all here, in that inimitable Anne Carson style. It was the prose that drew me most this time, especially a gorgeous essay on translation (“Variations on the Right to Remain Silent”) and “Uncle Falling: A Pair of Lyric Lectures with a Shared Chorus.” If you’re an Anne Carson fan, Float is a must-read. Honor’s Knight, by Rachel Bach: A solid follow-up to the very entertaining Fortune’s Pawn, which I talked about last week. 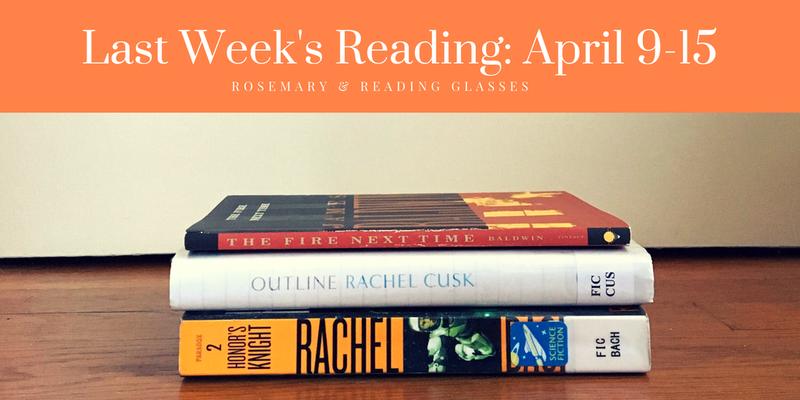 Outline, by Rachel Cusk: I enjoyed this unusual novel, which focuses on characterization over plot. The narrator, an English woman teaching a writing course during a hot Athens summer, reveals little about herself directly, instead recounting a series of conversations with friends, students, and acquaintances. Bit by bit, as her interlocutors reveal the details of their histories and surroundings, we piece together the narrator’s own character and experiences–just enough for an outline. The old dictum in writing is to show, not tell, but this book is almost all telling (and stylized; the conversations are unusually detailed and tend to lack context), but somehow Ms. Cusk has found a way to show the emotional truth of her narrator’s life. Outline won’t appeal to all readers, but I recommend it to anyone looking for a thoughtful, slow-paced reading experience. The Fire Next Time, James Baldwin: Baldwin’s prose is so good—it just moves the reader along effortlessly, like a swift current. The Fire Next Time reminded me of how I felt reading Baldwin’s earlier Notes of a Native Son and Ta-Nehisi Coates’s Between the World and Me, and though much has changed since The Fire Next Time‘s publication, much, alas, has not. It’s still essential reading on race in the United States. Layli Long Soldier’s collection Whereas* is a searing response to the congressional apology to Native American peoples (tucked away in a 2009 defense appropriations bill, signed by President Obama but not read aloud or offered in person to tribal leaders) and the legacy that apology (such as it is) represents. Whereas considers the language of government bureaucracy and history in poems that vary wildly in form. 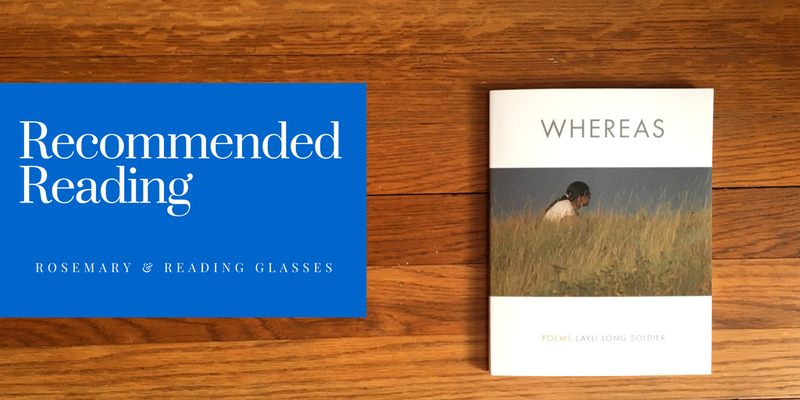 Here you’ll find prose poems, a historical narrative (the blistering “38”), found poems and poems that depend on erasure, a poem in the form of a definition, and on and on. It’s almost dizzying—you never know what the next page will bring. The work of living and observing language and its uses: these stood out to me as the twin subjects of Whereas. 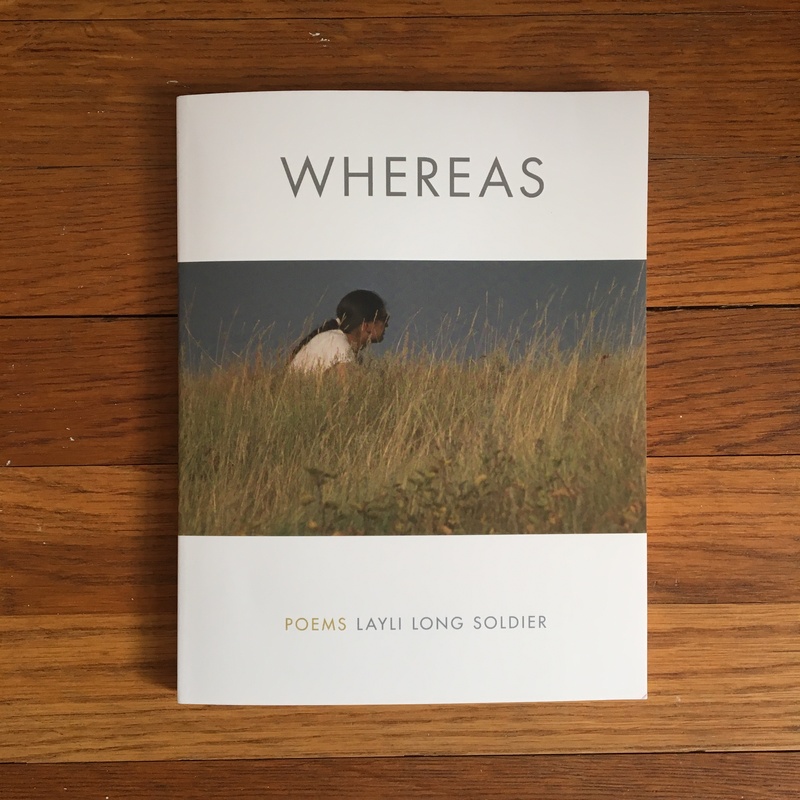 Of the latter, Ms. Long Soldier writes, “If I’m transformed by language, I am often / crouched in footnote or blazing in title.” In one of Whereas‘s most quoted passages, she writes, “I am a citizen of the United States and an enrolled member of the Oglala Sioux Tribe, meaning I am a citizen of the Oglala Lakota Nation—and in this dual citizenship I must work, I must eat, I must art, I must mother, I must friend, I must listen, I must observe, constantly I must live.” The personal—mothering, writing, living—serves as a counter to the formal, insidiously impersonal language of government documents, and it also highlights the effects that language has on people, culturally and physically. The poet writes of her weariness, her tooth that was pulled instead of saved thanks to budget sequestration (“Yet the root of reparation is repair. My tooth will not grow back. The root, gone.”), her relief at a real apology offered by someone close to her. Layli Long Soldier melds form and content in impressive, important ways. Whereas is highly recommended. 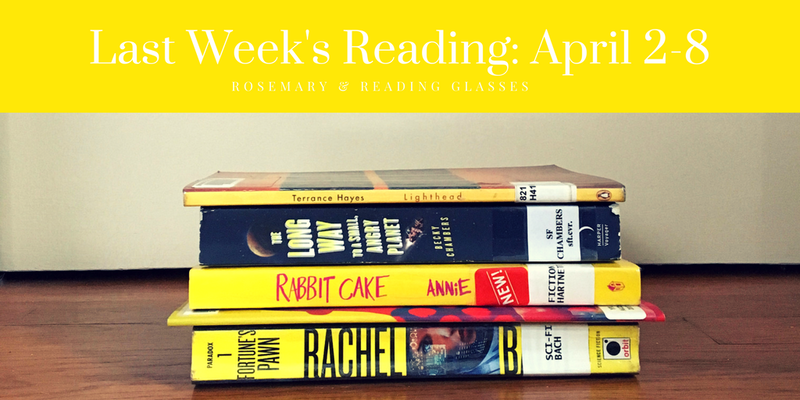 Rabbit Cake by Annie Hartnett: I requested this book on the recommendation of my friend Mary, who owns Newtonville Books, where Ms. Hartnett once worked. Rabbit Cake is narrated by precocious but not precious Elvis Babbitt, who recounts the events after her mother’s untimely death by drowning due to sleepwalking. As Elvis and her sister and her father try to hold their family together, each takes on different coping strategies of varying effectiveness (there’s a talking bird involved, and dozens of cakes). There was potential here to veer into over-stylized Wes Anderson territory (I love Wes Anderson, but I do not think I would care for his work in novel form), but Ms. Hartnett’s assured debut remains grounded in the Babbitt family’s frailties and love. Recommended. Portrait of the Alcoholic by Kaveh Akbar: This slim, striking collection whetted my appetite for Kaveh Akbar’s full-length book of poems Calling a Wolf a Wolf, coming this fall. The poems in Portrait of the Alcoholic are intimate and beautiful, a catalogue of desires—for drink, for God, for understanding—fulfilled and unfulfilled. Fortune’s Pawn by Rachel Bach: I’ve been on the lookout for Fortune’s Pawn ever since Rory recommended it years ago, and after striking out at bookstore after bookstore, I finally requested it from the library. Devi Morris (think Starbuck meets Ripley) is an armored mercenary with a big ego and the skills to match it. Ambition leads her to take a position on the Glorious Fool, a ship that gets into even more trouble than its name suggests. Devi thinks she can handle it, but she has no idea what she’s in for. This is a fun, action-packed sci-fi novel with a bit of romance—a perfect palate cleanser if you’re between more serious reads. The Long Way to a Small Angry Planet by Becky Chambers: I’m on a bit of a sci-fi kick, as you see. I adored this novel, which is like a whole season of Firefly packed into a book, only with more aliens. 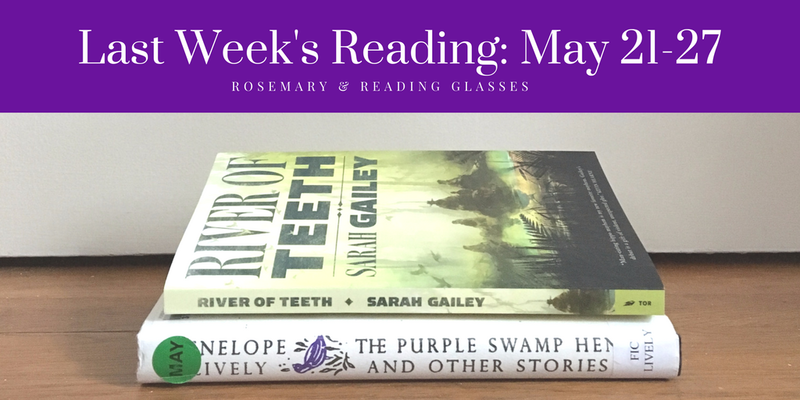 The setup is conventional: Rosemary Harper wants to escape her past, and what better way than be joining the crew of a ship that tunnels wormholes through space? Of course the crew is completely unconventional, from the reptilian pilot Sissix to the friendly AI Lovey and the cook/doctor, six-limbed Dr. Chef. On a long deep-space assignment, the crew faces adventure and loss and meets some of the most interesting sapients in the galaxy. The concerns of the novel are serious—how families are made, what sentience means, how gender and sexuality might look in a galaxy filled with different species, how risk should be valued—but the tone is lighthearted and warm. It’s a delectable book, and highly recommended. Lighthead by Terrance Hayes: Another entry in the “poets I should have read years ago” category. I’ve run across Terrance Hayes’s poems before, but this is the first time I sat down to read a whole collection. Lighthead is such a good collection: playful, melancholy, and multifaceted. These poems felt full to bursting with the richness of their language. My favorites included “The Golden Shovel,” a riff on Gwendolyn Brooks’s “We Real Cool”; “Carp Poem”; “God Is an American”; and “Lighthead’s Guide to the Galaxy.” Highly recommended. When You Are Engulfed in Flames by David Sedaris (not pictured since I read it as an e-book): This 2008 essay collection fell a bit flat for me; I’m used to breaking out into the kind of chortles that alarm small children and passersby when I read David Sedaris, but no one near me was the least bit startled while I read this book. I don’t mean to say that it isn’t worth reading—a few essays are quite moving—but I don’t feel the need to buy it for my own library. Readers might notice that on or around April 11 every year I post this poem or one like it, in honor of someone I loved very much.